Martorell, 14/11/2016. – SEAT is continuing its product offensive with the New SEAT Leon, one of the three pillars of the famous Spanish brand. The new model has all the necessary ingredients; comfort, technology and quality without forgetting the emotional ones; design, dynamism, pleasure, excitement and ease of use. And all of these make up the formula for success for a car that forms part of SEAT’s history; a formula based on design and functionality; the “Leon Formula”, the perfect combination of emotional and rational ingredients. These updates that the SEAT Leon is receiving are focused on technology and design. The New SEAT Leon will arrive at dealerships next January 2017, with pre-ordering starting at the end of the year. The SEAT Leon is currently SEAT’s best-selling model. Now, four years after its presentation at the Paris Motor Show, the time has arrived to move onto the next step, to evolve while at the same time maintaining the values that have always ensured that the SEAT Leon continues to be a reference point in its sector. Although upon first inspection there don’t seem to be many changes in terms of appearance, the Leon has actually been reinvented, thoroughly modified, paying special attention not only to the details but also to technology. “With the new Leon, we want to continue the story of success of an emblematic model for SEAT, at the same time including multimedia, connectivity, navigation, driving assistance systems and safety technology that now appear in the Ateca.” the vice-president of R&D, Dr. Matthias Rabe said. 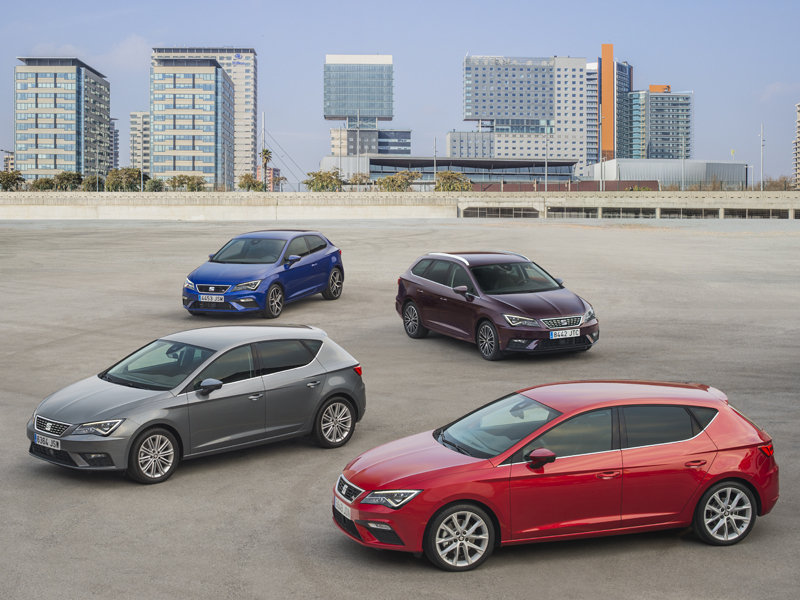 Without a doubt, following the market’s excellent acceptance, the upgrade that the SEAT Leon is now receiving, its main objective to maintain the essence of the car and improve its substance by utilising the technology being implemented in superior categories and making it available for category B. The changes that the SEAT Leon has received are therefore in two well-defined categories - design and technology. But the benefits aren’t only perceived in terms of safety, functionality or comfort but also in quality and reliability. The aesthetic modifications are centralised around the front of the car with a new, wider grille and new-look headlamps; on the side, the XCELLENCE offers an exclusive chrome frame of the windows while for the rest of the range the chrome frame stands out in black, while the front and rear bumpers are new too, all with LED technology that include indicators and fog lights. New wheel designs also feature on the new Leon as well three additional colours: desire red, mystery blue and boheme purple. On the interior there are aesthetic changes that reflected the new central console, new STD upholsteries in all trims and new lighting with LED in the cockpit, also with LED technology. The materials used are clearly of a better quality in the interior and on the central console which is slightly elevated, also now includes the electric parking brake. In any case, the applied technology is the newest thing about the new SEAT Leon. Most of the new Leon’s innovations are inside, under the bodywork. “Let’s say we’ve put the Ateca inside the Leon,” says the vice-president of R&D at SEAT, Dr. Matthias Rabe. The new SEAT Leon includes a GPS with a new 8-inch screen and a new central console (the whole connectivity system that is found in the Ateca) the wireless charging systems for smartphones or for keyless access (both to the car and boot), as well as many other things. And of course, the latest advances in driving assistance systems that will be discussed later.